NCF would like to wish all our partners and supporters Eid al-Adha sa’id, kul ‘am wa antum bikhair! Last week, Judge Ido Rozin, from the Beersheba Magistrate Court, ruled that 6 of the residents of al-Araqib will pay the state 250,000 NIS for the expenses of the first 8 demolitions of their village, and an extra 100,000 NIS to cover expenses accrued by the State Attorney’s Office throughout the legal process. The village was destroyed on the 23rd August for the 117th time, just a few days after a protest event in the village, marking 7 years for the first demolition. 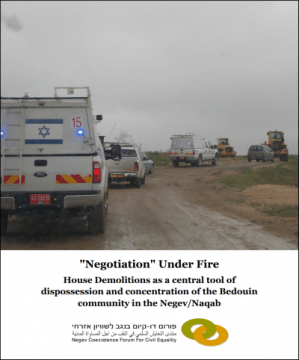 NCF’s new report: “Negotiation” Under Fire – House Demolitions as a central tool of dispossession and concentration of the Bedouin community in the Negev/Naqab – is now available online. The report presents up-to-date figures regarding the demolition of structures among the Bedouin community of the Negev/Naqab during 2016. It exposes the systematic inequality that exists between Bedouins and Israeli Jews before the law, with reference to the field of planning. Furthermore, the report emphasizes the connection between the struggle over land ownership and the authorities’ “settlement regularization” activity, highlighting the different ways in which the state leverages practices of enforcement and demolition to reorganize space in the Negev/Naqab.